Learn more about Iowa invasive species as we celebrate National Invasive Species Awareness Week, February 26 – March 2, 2018. Invasive species are species of organism that are not native to an ecosystem and which cause harm. Invasive species generally grow and reproduce quickly, and spread aggressively with the potential to cause harm to the environment, the economy, and even human health. 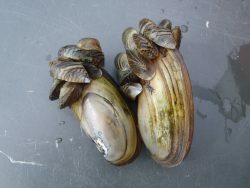 Check this PDF from the Iowa DNR to learn more about zebra mussels. Invasive species are spread intentionally and unintentionally through human activity. Throughout history people have introduced foreign species to new environments for aesthetic and economic reasons. Species are also introduced inadvertently on ships, in wood products, through ornamental plants, pet trade, and other means of transportation. Invasive species can cause harm various ways. They pose a threat to native animal species by outcompeting native species for resources, preying on native species, and carrying diseases that harm them. Invasive plant species displace native plant species. An invasive plant can quickly take over an area causing clogged waterways, and improper growth and germination of native plants species. Many invasive plant species provide no food value to native animal species. All invasive species also threaten the delicate balance of entire ecosystems by disrupting the natural food web, decreasing biodiversity, and altering ecosystem conditions. Plant natives in your yard and remove any invasive. Learn to identify invasive species in your area. Report invasive plant and animal sightings to your local county extension office. When boating always clean your boat and trailer and check it for aquatic invasive species before putting it into another body of water. When camping do not bring your own firewood, instead buy locally grown firewood. Plant native grasses, flowers, and trees in your yard or schoolyard. Design and implement a local invasive species study. Raise awareness of invasive species. Put together an awareness poster or campaign and help spread the word. Looking for classroom activities about invasive species?